Target Marketing offers the best in non-dues revenue to its Chamber of Commerce Partners by providing the best possible return on the investment for the sponsoring Chamber Members. Our professional business to business sales and marketing associates work with each member, no matter how big or how small to create a professional marketing message for their business. 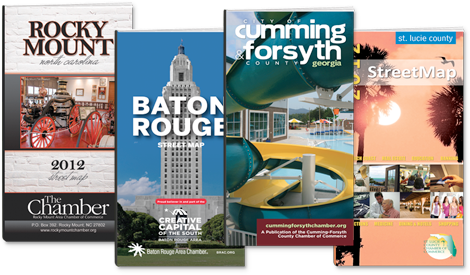 Maps remain the number one marketing and promotional print piece distributed by Chambers of Commerce. While navigational and GPS devices have replaced the in vehicle map usage of the past sixty plus years, there still is no better option for a soon to be resident or relocation candidate. When people, businesses, families and even entire organizations move to an unfamiliar area, they need to know where and what schools are readily available, where the optimum places of worship are located, how many miles a potential neighborhood or development will be from their future place of employment, what the tax ramifications are for different cities and municipalities and how far or near they may ultimately reside from popular area attractions and travel centers such as airports and mass transit. Again, a relocation candidate needs to know this information and there is no other single and central repository for information than Chamber of Commerce maps.